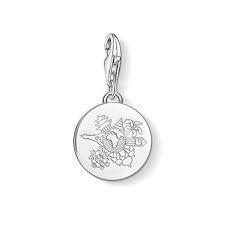 From Thomas Sabo Charm Club is this Silver Wanderlust charm. A stunning addition to any Thomas Sabo charm bracelet. This charms adds a personal touch to a gift for her. This Thomas Sabo Silver Wanderlust Charm features a circular disc with Earth engraved on the front. Surrounding Earth are several landmarks such as the Eiffel Tower and Big Ben. On the reverse of the disc is text that says 'Travel the World'.